Things I liked: As soon as you open the box you can tell this is a great purchase. I love the Romanian design of the AK47 which was what drew me to this gun. 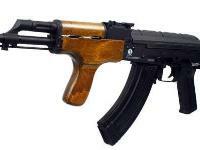 Plus I wanted to convert a Romanian AIMS to an RPK ( Which I have done with this gun). Right out of the box this gun shot for me about 425fps with .20g BBs. Good accuracy too. 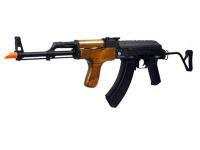 The wooden furniture on this AK is nice for what it cost, and felt great when hefting it like it was made for. I especially love the blow back feature. Gives it a realism when firing. 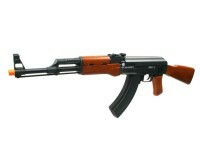 If you like the AK format like I do, then I'd highly suggest this piece be in your arsenal of airsoft weapons. What others should know: There are a couple things on other reviews that are misleading. 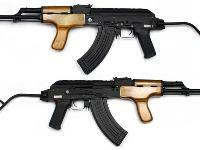 FOLDING STOCK.. people will post how wobbly the stock is. On any wire stocks you will get a slight to almost non-existent wobble. I can barely notice it on my gun. FRONT FORE-GRIP... If this appears to be loose when you get this gun it is EASILY fixed. 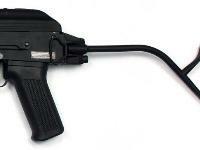 At the front of the fore-grip, the black fixture that holds the grip in place has a little lever. Flip the lever and it will loosen the wood grip for disassembly. Simply pull the grip and front lock back against the body tightly and flip that lever back to it original position and you fixed it, no wobble. If you want to purchase this gun, do not let poor reviews deter you from it. This gun will provide you lots of fun. Things I liked: When i first got the gun i thouht i got jipped off because the wood looked a little dingy, it was a little loose, and the wood grip didnt feel right. 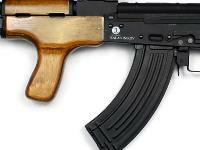 I was actually dissapointed because i was really looking forward to the forgrip..i had the tactical kalashnikov ak47, so i just took the ris rails off that gun and put it on the AIMS, so now my gun is all black, with the folding stock.....SAAAWWEEEEEEEET !!!!! i almost gave up on this gun because just because of the loose forgrip, BUT !!!!!!! the next day i went to the usual airsoft war and we all had to get our guns chronod as usual. NOW, i NEVER shot this gun because i wanted it in the best shape as possible on the field. this website says the gun shoots 410 fps with .20 grams. I WAS USING .23 GRAMS AND THIS GUN SHOT 436 FPS !!! and to make it even better, i chronod the gun after 7 hours of playing and the gun chronod at 442 fps !!!! and whats even better is the range on this thing. words cant even explain ! and its sooo freakin accurate !!! 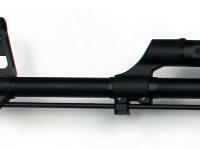 with the adjustable hop up the gun gets even BETTER !! overall, awsome gun ! im keeping this gun for a while ! oh yeah, you can also put a rail on the side so you can have a sight on your gun. What others should know: this guns is great, BUT it gets heavy after a while, so just invest in a sling..and also, of course, dont shoot this gun within 30 feet..it will make people bleed, no doubt ! Things I liked: the weight, the realism the amount of damage this thing can do, and the rate of fire.